I recently had the pleasure of partnering with Jimmy Buffett's Margaritaville Restaurants and they made sure I was taken care of at the awesome new location at the Mall of America here in Minnesota. So I called up another single guy I know - my Dad - and we had a super fun lunch. We got to catch up on family stuff, sports news, and politics - all over coffee and pie, two of his favorite things. Once we both arrived, we were greeted by the super friendly wait staff at Jimmy Buffett's Margaritaville. After a bit of chatting with the managers and various other people who were working there, we promptly ordered bottomless coffee and we were off to the races. We caught up on various things, upcoming parties, family ailments, etc. Adult things you don't necessarily always want to think of - but my father and I have a good relationship in that way. We don't pull any punches - but we also know when and how to push each other's buttons. Once we got caught up on all things-family, we decided to put in an order for some of the new menu items at Jimmy Buffett's Margaritaville. 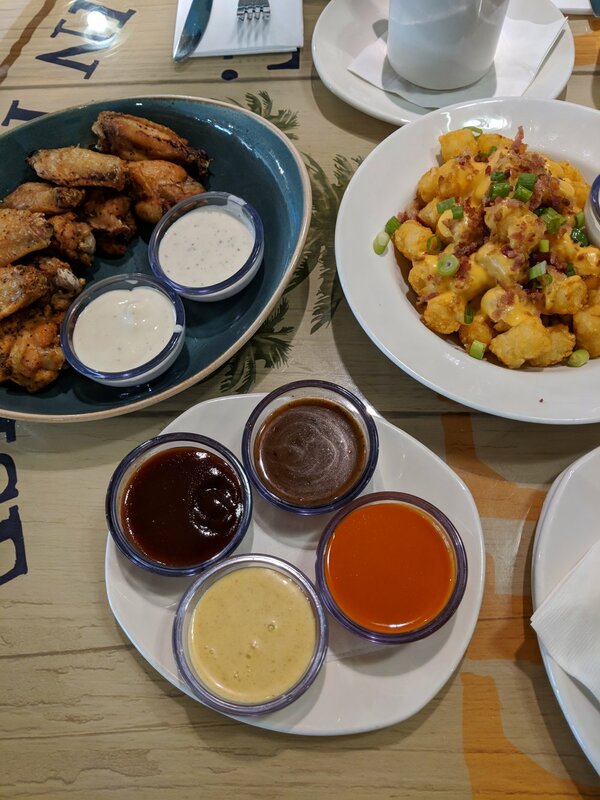 The staff members were super agreeable when it came to our order, so we got some regular wins with all of their new sauces as well as an order of their loaded tots. Now, if you're a fan of awesome bar food or things you can munch on during the big game on a Sunday, Jimmy Buffett's Margaritaville is an awesome spot for treats like this. We weren't sure if all of this food was going to be enough - but it was the perfect amount of food for two, full-grown men! We didn't need to adjust our belt holes just yet as we had to save room for more coffee and, of course, key lime pie. And boy, was it super, super worth it. Finally, we ended the awesome lunch with a couple of pieces of key lime pie and we finished off our cups of coffee. I'm pretty sure the picture to the left wraps the afternoon up well: Laughter and smiles over appetizers, coffee, and pie. We both really enjoyed our time at Jimmy Buffett's Margaritaville and it's safe to say we'll be back. Being that my dad lives about an hour from the Mall of America and I don't often find myself there, it's fun to have the memory of a simple lunch bringing such joy to us and our relationship. A huge thank you to the awesome wait staff and overall restaurant that is Jimmy Buffett's Margaritaville! You've made two friends - and we'll surely tell all of our family and friends about our visit in the months to come!